Shrinking the live-action movie to a smaller size, 2016 Funko Warcraft Movie Mystery Minis tackle the live action Warcraft film with a dozen key figures. Similar to trading cards, the 2016 Funko Warcraft Movie Mystery Minis are issued in a blind-box format that features one unknown figure per box and 12-box cases. This can make tracking down the set a challenge and also offers the opportunity for short printed figures and rare variants. The main lineup consists of 12 subjects and includes figures for orcs like Durotan and Orgrim as well as humans like King Llane and Lothar. Other notable characters for the film are represented in the set. Each standing approximately 2 1/2" tall, the full odds for the 2016 Funko Warcraft Movie Mystery Minis are fairly simple. With 12 figures in the set and 12 boxes per case, each carries 1:12 odds. This makes completing a set much more manageable. 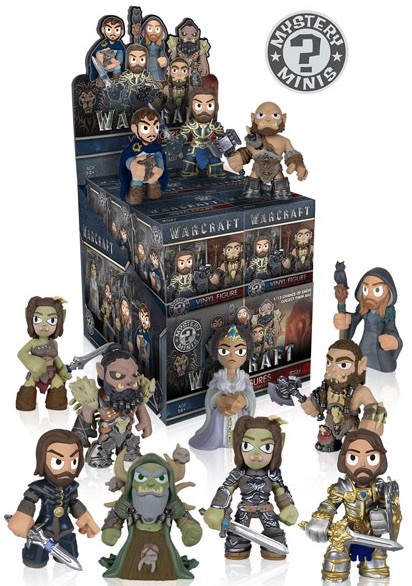 Collectors can also find larger figures for select Warcraft subjects with the Funko Pop Warcraft line. All figures average 1:12 boxes.